As a sports trainer it is imperative to have a good understanding of the supplies you will need in order to do the best job possible. The Sports Club Zone is aimed at giving clubs and trainers access to the info and product ranges used the most, without having to spend time scouring through the whole website. Our staff at APE know a thing or two about what medical supplies a sports club needs. They are either sports physios or have all played sport at a high level. If you’re not sure, just contact us. Every year APE Medical and tape manufacturers run rewards programs. Sport clubs and organisations can claim all these rewards when they purchase their medical and strapping tape supplies with APE Medical. It doesn’t matter which brand of tape and supplies your club uses, you will get rewarded. 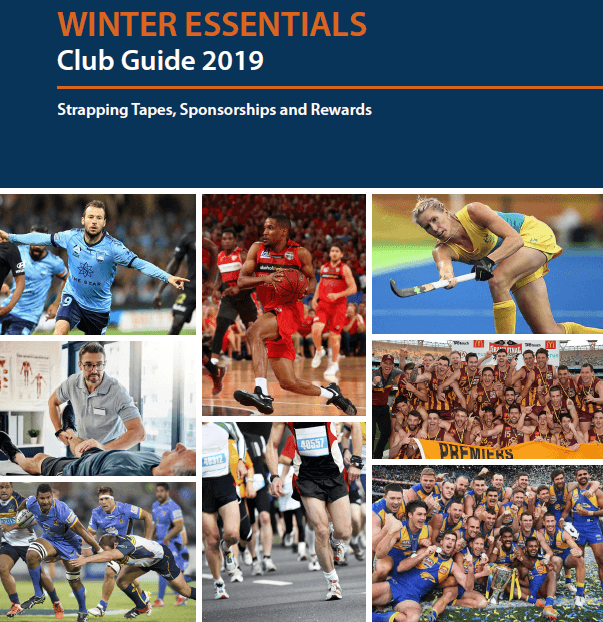 The 2019 Essential Winter Guide is out now. Click the pic to download and view what is on for season 2019. Your club can earn up to $1500 of rebates and sports medicine equipment by using APE Medical this year. At APE Medical we understand clubs have budgets. If you have a specific budget that you need to stick to, then please contact one of our account managers who can tailor your package. You will still get rewards no matter which product brand you go for so we can guide you through all the options. Download our Sports Club Checklist to make sure you have all the essentials before the winter season starts. – Sports Medicine Australia– SMA run the Level 1 and Level 2 Sports trainer courses as well as taping events. Their website is a great resource for anything sports trainer related. They have video demos as well as injury and sports fact sheets. Check them out. – Strapit– They are conducting taping courses around Oz, including their new Functional De-load Techniques (FDT) using Active Gripit tape. Check out where there is a course near you. – WAFTA– The WA Football Trainer Association conducts strapping courses through the winter season. If you are located in WA then they are well worth checking out and getting involved with. – AAP Education– These guys run a number of different courses around Oz including acupuncture, RTU, manual therapy and anatomy courses. There is plenty to check out at their website including case studies, current courses and more. – Rocktape– Rocktape run courses all over OZ. Check out their website for a course near you.